St. Thomas, in the U.S. Virgin Islands is a 32 square mile piece of paradise with breathtaking beaches, historic forts and places of worship, vibrant nightlife and dining plus snorkeling, diving, sightseeing and sailing. On our most recent visit to the island, we joined a Flavors of St. Thomas Food Tour for a delicious, educational, laugh-filled leisurely stroll through Charlotte Amalie. We mixed our own Painkillers (Cruzan Rum, pineapple juice, orange juice, coconut and nutmeg) and snacked on pulled pork tacos where the singing group The Mamas and Papas once lived at the Side Street Pub. At the 250 year old Cuzzin’s, we dined on heaping plates filled with Caribbean BBQ Sweet BBQ chicken, BBQ ribs, plaintains, and fungi with okra. We walked to but not up (thank goodness) the 99 Steps built from yellow ballast bricks brought from Europe. The bricks were unloaded in St. Thomas, the ships were filled with goods for their return and the bricks were used on the island. We visited the 350 year old Frederick Lutheran Church built from the yellow ballast bricks. Our final stop was at Jen’s Island Café where we sampled a piece of Jen’s Rum Cake. Jen’s husband Marty loves to visit with guests and share stories and legends of local history. Our tour guide, J.J. / Juan was extremely knowledgeable of history. His outgoing personality and great smile made our tour enjoyable. We asked Flavors of St. Thomas Food Tours Director of Operations Mikol Hoffman to tell us more. In one sentence, what is Flavors of St Thomas Tours? 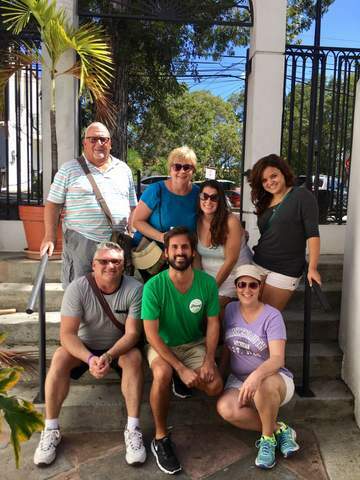 Flavors of St.Thomas Food Tours is a food tour operator that's passionate about four things: food, history, culture, and sharing all those with our guests. Why is Flavors of St. Thomas Food Tours a great way to see St. Thomas? Eat Well, Be Inspired® is our motto, and we think everyone who loves to travel, explore and eat well can share and identify with that. Our food tour is an entirely different way to get to know the island and its culture - through your appetite! Flavors of St.Thomas Food Tours is the sister company of Flavors of San Juan Food and Culture Tours and imparts the same unforgettable experience and high quality tour guests have grown to expect from Flavors. Why is Flavors of St. Thomas Food Tours a great way to see sample the foods and drinks of St. Thomas? Flavors of St.Thomas Food Tours gets you past the tourist traps to the real hidden foodie gems that will surprise you about the U.S. Virgin Islands. Eat Well, Be Inspired® is our motto, which we think everyone who loves to travel, explore and eat well can share and identify with. Our walking food tour helps you make the most of your stay in port as you experience the food, history and culture of St. Thomas' historical capital city, Charlotte Amalie. We handpicked the best locations for authentic local food so you don't have to do any work during your stay with us. Skip the lines and head straight for the tantalizing food. Our guides will keep you entertained with a fun historical narration of the city while enticing your tastebuds. Meet the small mom and pop owners behind the scenes while sipping on a rum cocktail and other savory delights that make up a full meal. By the end you’ll know the best places to eat in St. Thomas and leave our tour with the confidence and knowledge of the local food scene. What can you tell us about Flavors of St. Thomas Food Tours guides? Where can those interested get more information? 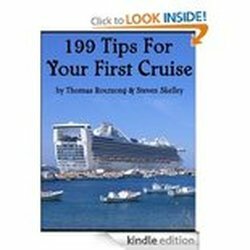 Please visit our website at www.flavorsofstthomas.com or call +1 (855) 569-6222.